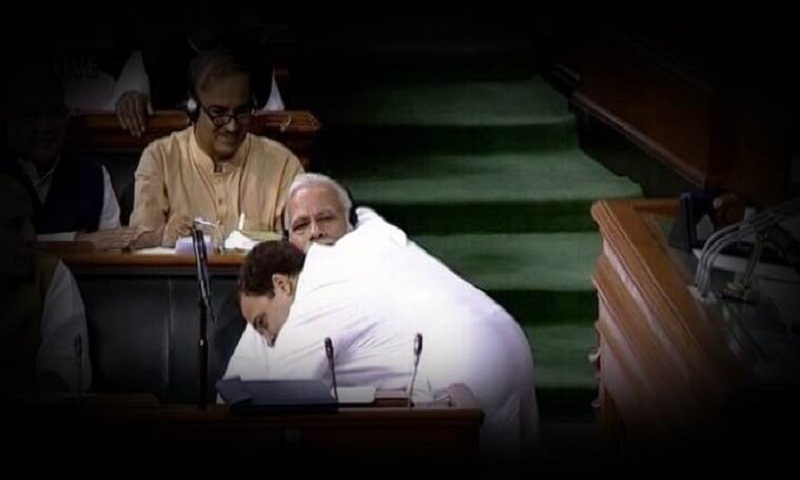 Was Rahul Gandhi’s hug to Prime Minister Narendra Modi pre-scripted or a spontaneous gesture? Did it disarm and derail the BJP? Was it an immature act or a conscious, well thought- out tactic to convey a larger message? The jury is out but Rahul Gandhi has managed to hog the headlines and set the narrative, at least through the day as Lok Sabha continued debating the no-confidence motion. Congress leaders say they were as surprised as the prime minister when he walked across and embraced Modi. “It was an absolutely spontaneous act,” says the party’s communication department head Randeep Surjewala said. Party leaders point out that the embrace may have surprised everyone, but argue the spirit behind the act has been a recurring theme in Rahul’s speeches. “He has always talked about love and argued that the politics of hatred is damaging the social fabric,” a senior leader said. But it was the Congress which has been ridiculing the prime minister arguing that foreign policy and diplomacy under his watch has become ‘hugplomacy’. In fact, Rahul had in November 2017 mocked the Prime Minister ‘hugplomacy’ with US President Donald Trump after Pakistan released 2008 Mumbai attacks mastermind and Lashkar-e-Taiba chief Hafiz Saeed from house arrest, The Indian express.